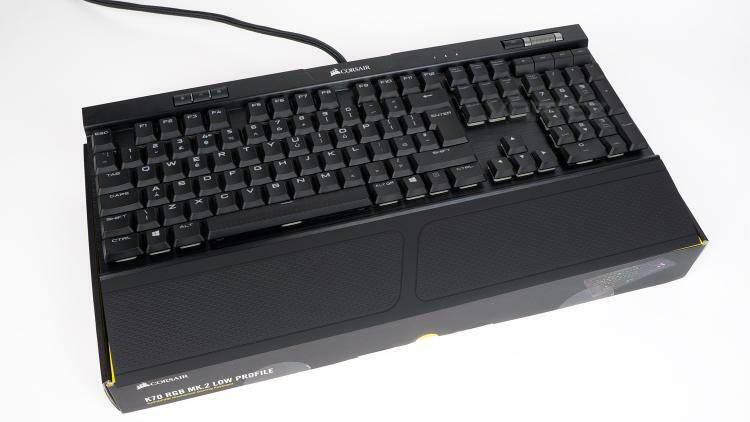 The Corsair K70 is a well-acclaimed keyboard that has been around for quite some time now, and over the years it’s seen a fair few subtle facelifts as well as some incremental performance tweaks, but the MK.2 changed that with its biggest update yet. If you wish to see how the K70 has evolved over the years you can check out all our reviews on them. So, now you’ve seen the differences between the older K70’s and the newer MK.2, you may be curious to see what the even newer low profile variant brings to the table. Well, at first glance it doesn't look like much has changed, sure the keycaps are now flatter and wider, but other than that - aesthetically at least, not much has changed. Where you do see the biggest difference (visually) is with the height, the Low Profile MK.2 or LP MK.2 (to shorten it) is 25% slimmer than the K70 MK.2 though it remains just as long and wide. The most notable change the LP MK.2 sees, however, is on the switch front. As the LP MK.2 is a lot slimmer, Corsair couldn’t exactly install the regular switches Cherry make, so instead, they’ve selected Cherry’s new low profile switch, will this have a negative impact on the performance? Read on to find out. The CORSAIR K70 RGB MK.2 Low Profile Mechanical Gaming Keyboard combines the all-day comfort of low-profile, low travel keys, with the performance of Cherry MX mechanical keyswitches and stunning RGB lighting.